This large white hair bow is the fabulous hair accessory that your dresser has been missing! Exuding a sense of innocence and poise, this hair bow will give any lady a polished yet playful appearance. Everyone can enjoy this large ribbon bow, whether your hair is long and curly, short and straight, or anything in between! The genius French clip fitted at the back allows this accessory to be worn with natural or synthetic hair – simply clip your hair into place and this bow will stay put for the whole day and night! You won’t believe how many outfits are made cuter with the addition of this pretty little accessory. It is just perfect for pairing with pettipanties and maids uniforms, adding that touch of playfulness that you have been missing. 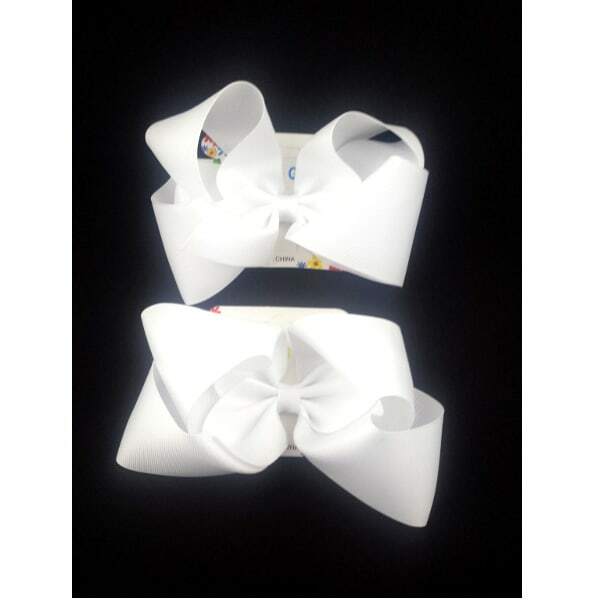 This white hair bow goes especially well with schoolgirl uniforms, as it is quite reminiscent of the white ribbon accessories that young girls often wear. At only $2.99 each, these large hair bows are impossible to resist. Use them to clip pigtails or braids in place, or simply to pull back your bangs. Regardless of how you choose to style your hair, these bows will be pretty, flirty, and fabulous!